I'm reading Age of Innocence for the Age of Innocence Read-a-Long, hosted by bookworm meets bookworm. See other participants' thoughts on Part I listed here. Twenty pages into Age of Innocence, I found myself thankful to be married in the 21st century rather than the 19th. Wharton's account of marital expectations in the 1870s leaves much to be desired - by both husband and wife. This is the environment in which we meet Newton Archer, a Societyman to the core, related to any number of other high-Society figures that would require a complex and confusing family tree to keep track of, as they all insist on marrying their cousins and/or have the same last names as a family from some other high-Society city. Enter May Welland, his lovely fiancée. Enter malaise, uncertainty, boredom, and - gasp! - the unhappiness that these ingredients create and yet no one is willing to talk about. 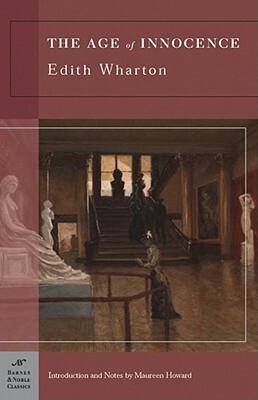 Most striking to me about Wharton's novel (thus far, at any rate) is the extent to which the situations she writes about then are still applicable now. Newton Archer suffers the same boredom and lack of fulfillment we dedicate enter self-help sections to today. I could see him browsing the aisles of the Union Square Barnes & Noble (as an decent Society-man knows one never ventures above 40th St), picking up Midlife Crisis Come Early? and How to Find Fulfillment, Meet Your True Soulmate and Live a Really Happy Live and even the non-made-up title, Men are from Mars, Women are from Venus. It seems Wharton's 19th-century characters struggled as much with the definition of happiness as we do today. And though their mores are more stringent than current society's might be, the Society (capital S) of New York City is a society (lowercase s) of rules, norms, and definite ideas of decency. We might allow Skins to air on MTV during primetime, but we're still a pretty norm-based society, folks. Just look at what happens when a politician gets caught cheating on his wife. Just like the Societymen of Archer's time, it is not that men are expected to be loyal to their wives, just that they are expected to be discreet about it. Archer, a rather likeable guy, sees the hypocrisy in this, but in the face of Society and its damn norms, what can he do? I suppose it's up to Part II to see how true that really is. All page numbers from the Barnes & Noble Classics Edition.